Senior Pastors, Associate Pastors and their Wives from across the state will come together to fellowship and learn. We’re not a denomination…. we are family. We need a yearly family gathering. Our state is a great size.. it’s not so huge that we can’t all know each other, appreciate each other, love each other and eventually share life with each other as pastors & wives doing K I N G D O M ministry in the same state. In the days of the judges like the book of Acts it was the Holy Spirit that brought power to ordinary men & women. Like you. Like Gideon. That’s my heart….to see us united in anew way as a state. All of us under one roof crying out to Jesus for a fresh move of the Holy Spirit in our marriages, families, leadership & churches in that order! Join us for this year’s for Shepherd the Flock, July 22-24, 2019. I have been attending conferences all of the globe for almost 20 years and this conference was one of the most refreshing times I have ever experienced. It’s all about the fellowship and the open hearts of the folks there. Just an absolute treasure. Shocking. First conference I’ve been to in 20 years intentionally guided by the Spirit and relationships rather than ideas and agenda. Walking away transformed rather than educated. Jaclyn and I both thought that this conference was the best we have ever been to. Even though it was our first.. your staff set the bar incredibly high and we already can’t wait to come back next year. We both thought the amount time given to prayer and ministering to one another’s needs was huge and as it turned out was very beneficial to all weary pastors and those doing well alike. This conference felt more like a retreat than it did a conference and I loved that. There have been many Pastor/wives conferences that we have attended over the years of ministry we have served in. I can honestly say that this years Oregon Pastor/wives conference was the BEST!! I think the reason can be summed up in one word; “REAL” real people, real issues, real teaching, real prayer, real fellowship, real ministry. Thanks to all who participated, and a special thanks to Rob, and Suzy for hosting us all, and to the Corvallis Calvary crew that took such good care of us all. If you were not able to make it this year, make sure you make it next year for sure! As an assistant pastor at Calvary Chapel Southeast, this was my first time attending the Shepherd the Flock Conference at Calvary Corvallis. This conference provided what I needed at just the right time and served to encourage and refresh both my wife and myself in the ministry. I especially appreciate the emphasis given to prayer, it was like being dipped in the spring of life. I can say without hesitation that this was unlike any conference I have attended in my twenty plus years in ministry. I’ve been in ministry for over 36 years and have attended a lot of pastors conferences. Some blast you with excellent information from gifted teachers. Some frustrate you because of the “bragamomies” of the “successful” pastors. The Oregon pastors conference puts the Holy Spirit and prayer at the top of the agenda. This has produced an atmosphere of humility and openness that is so refreshing. God has used this conference every year to renew my calling and reveal His amazing love. I have always enjoyed the Corvallis conferences and so has my wife. Although we have a goodly number of men serving the Lord in our State, without such a conference we would know very few of them! Most of us are scattered, busy and intensely concentrated on the “home front where we serve! “The conference gives us an opportunity, for a few hours, to remind ourselves that we are not alone and that ministry is happening around the corner and around the State. Thanks again for your faithful efforts in making the conference a time of “refreshing,” & “renewing” relationships, and reinvigorating our hearts and minds to serve with grace and vigor! All I can say is wow, I’ve never been to a conference that is more real than this! The sweet times of waiting on the Lord as pastors and wives in prayer and worship were as if the Lord were drenching us with buckets of His Spirit. We experienced a beautiful continuity of the Spirit flowing throughout the times of teaching, worship, fellowship and prayer. So much more than an informational conference, but rather an intimate time of family, loving one another, weeping and rejoicing with one another, praying for each other and growing together in God’s grace. Such a spiritually refreshing time. This year I loved the laughter- the times of uplifting, safe fellowship with like minded sisters. The conference in a word- family. The distance between each of our lives seems to be getting smaller. I’ve been to many conferences over the years and been blessed by so many great times of fellowship and teaching at them.This years conference left me so full so encouraged not just by the fellowship and great teaching but especially by the powerful spirit filled times of prayer, prophesy and worship. It was my wife and I’s first time attending this particular conference and although I’ve attended many conferences over the years (both large and small), I absolutely loved the relational aspect that this conference provided. I look forward to building upon the friendships that we made over the past couple of days. Again, many thanks to you, the staff and volunteers at Calvary Corvallis; I can honestly say that I have never walked away from a conference more refreshed. There are regular conferences, and then there are Spirit filled relatable encounters with brothers and sisters who are jointly building each other up in the faith! This is what we experienced at our recent Pastors/Wives conference at Calvary Corvallis. This is going to be a “must attend” for years to come for my wife and I, who were ministered to by fellow Pastors and wives. This annual event was lovingly done so well by Pastor Rob, the staff, and volunteers at Calvary Corvallis! We just wanted to thank you for all the effort that went into putting on the Conference this year. Truly one of the best conferences we have been too. It was great to be in that environment. The Holy Spirit was truly leading the whole experience, it was also a blessing to make some great connections with the other Pastors and their wives. We are looking forward to future conferences and the work the Lord will do. What a Spirit filled and lead time of refreshing and encouragement at this year’s conference! Such a powerful time of bearing one another’s burdens with other pastors in the state and through it developing relationships that will last well beyond just our three day together. God has been so faithful to respond to the intentionality of the conference to set aside time to seek and wait upon Him. Already looking forward to next years time together! It was a sincere time to seek and find, to receive and give, to be pruned and grow, to listen and be listened to, for tears and triumph..How good and pleasant to dwell together in unity! Thank You! 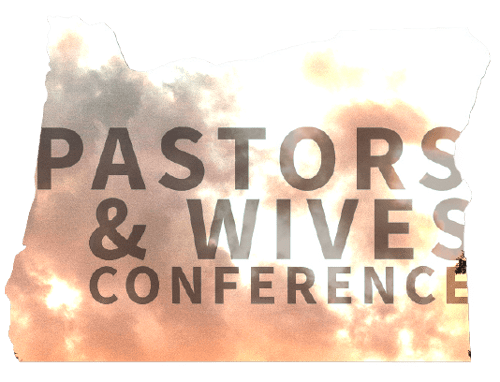 I wanted to personally thank you and your Corvallis team for hosting such an amazing Pastor/Pastor Wives conference for the Oregon Calvary Chapels. It was both spiritually refreshing and confirming to me about the role I have as an assistant pastor. I especially appreciated the breakout sessions we had as assistant pastors. What a tremendous time to pour into each other, pray for one another and share best practices. First, thanks for being flexible to the Spirit. I was talking with my wife and Karen about how the wind hits a tree and the limbs move in different syncopation with each other, to make the tree stronger when great storms come. There was a great breath upon the Bride from the Lord of Liberty and Comfort this conference. I have been in Oregon for 28 years now going to many conferences as many of you have. Coming to the Oregon Pastors Conference has been a blessing and refreshing time from our Lord for both myself and my wife. I believe God is doing a work here and we have the blessing of being a part of it. I pray that if you who have not attended that you would truly pray and see what our Father has for you. Getting to know those who serve in other cities in Oregon has been a true blessing. Come join us and be a part of what God is doing here in Oregon. Just wanted to thank you and your staff for the hospitality. It was one of the best times for sensing the Lord’s presence. Men and women being real with each other and not playing Church. I needed the refreshment I received by His Spirit. My wife and I are closer with that clear vision for the next year. Looking forward to the next one. What a wonderful, fruitful experience for my wife and I during this intimate, Spirit-led time of waiting on the Lord, worship, fellowship, and great teaching. The conference was a perfect venue for us to spend time together away from our daily routines in the peaceful setting at Calvary Corvallis. We also totally enjoyed forging new relationships and strengthening existing ties while here. Coming to the conference showed me the shared brotherhood of those in ministry, all struggling and experiencing the same triumphs and hardships, all fully reliant on Christ no matter the size of congregation. It was a powerful reminder we are all ONE body, sharing in the work of Christ. It was an Edifying experience.